Once my birthday is past, my thoughts turn to Valentine's Day and Spring! This year, I was inspired by Victoria Magazine (an old beloved friend, returned at last!) and by Aina of Modern Country to make my own feminine display on top of my china cabinet. Victoria Magazine depicted a similar garland in their January/February issue that I fell in love with. Right away, I knew I wanted to make one, but using my favorite pale flowers in keeping with my mostly white decor. Choosing the ribbon color was the hardest part because I didn't want it to be too pink. I nearly used lavender and then tried a sage green, but neither had effect I wanted. Then something made me think about this bright kiwi/lime green ribbon and it was perfect! 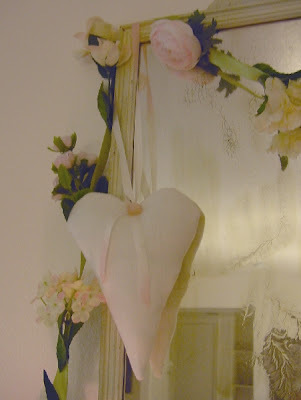 The linen heart with it's varigated pink silk ribbon was inspired by one that Aina at Modern Country made for another favorite blogger of mine, Outi Loimaranta at White Country. I had a few scraps of pristine white linen that were the perfect size! In my ribbon embroidery box, I found the perfect pale pink and white varigated ribbon and my button box turned up the soft satiny pink buttons. I like the bare touch of color. The sheen of the linen is so nice. Like my Christmas vignette, I'm sure this one will bear some tweaking in the next few days. For right now, it fills me with hope and gladness! My 50th birthday was yesterday! While I'm still not entirely sure how I feel about being 50, having the opportunity to celebrate it with my sister was a joy! We had a fabulous Japanese dinner with divine "Dragon Sushi" and Miso Soup. Then we spent the evening scrapbooking at a lovely store here in town that has "Midnight Madness" scrapbooking every Friday from 6pm to midnight! My sister told me we had assigned seating this week and what did I find at our table? 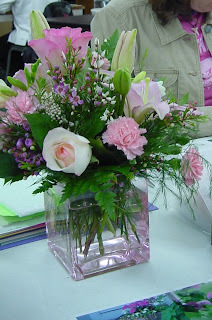 The most beautiful bouquet of pink and cream flowers from her! So lovely! As I have been scrapbooking my Colorado garden, which was filled with pink roses that I dearly miss, the flowers were uplifting and helped me feel like I was for the evening, still in my garden! What a delightful blog you have! I'm glad you stopped by my blog and left a comment, so I found my way over here. The little dotee dolls in your previous post were absolutely darling! And inspiring too, so I will be adding them to my future projects to do list. Happy birthday! I agree with the first comment, and am so glad I came by here, it is a pretty place to visit! I had to read through and really enjoyed your rainbow babies. I used food coloring one year to make my kids into Smurfs for Halloween and they were blue for weeks in splotches here and there. Molty Smurfs.